We hire out function rooms (one has en suite kitchen facilities), a medium sized Sports Hall and a large sized Sports Hall for daytime and evening use, all are available with plenty of tables and chairs if required and all have access to the kitchen facilities. 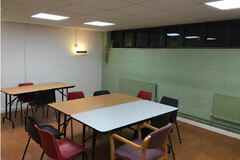 This room can be hired for £15 per hour. This rooms dimensions are 5 x 6.2 Meters. The function rooms dimensions are 9.5 x 8.5 Metres, the floor is lino tiled and there is a shuttered kitchen area for making Tea, Coffee & serving food. 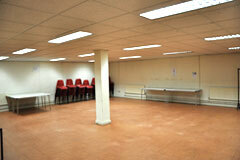 This is a multi purpose room which is ideal for informal meetings etc. The hire cost is £25 per hour. The Halls dimensions are 18.3 x 9 Metres. 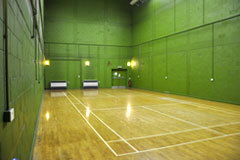 This hall is used mainly for Badminton as a court is marked out on a polished wooden floor, but it can be used for other purposes such as fitness classes, dance or other sporting activities. The hire cost is £25 per hour. The Halls dimensions are 19.5 x 14.5 Metres. 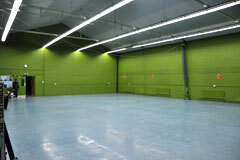 This hall has excellent lighting, non slip sports lino and is for multi purpose use. The hire cost is £25 per hour.